Something warm and satisfying for your fall table. Heat a medium soup pot over med-high heat. Add the fat and then the onions and carrot. Saute and stir occasionally, until the onions soften, about 5 to 8 minutes. Do not let the onions or carrots brown. Sprinkle a large pinch of salt and pepper over the carrots and onions as they cook. Add ginger and curry powder and saute one minute more. (The curry flavor is meant to be very subtle – feel free to add more if you like a strong curry flavor). Add stock and water (liquid should just almost cover vegetables – adjust amount if necessary). Bring to a rolling simmer, then turn down heat to low/med and partially cover. Cook until the carrots soften, about 20 minutes. 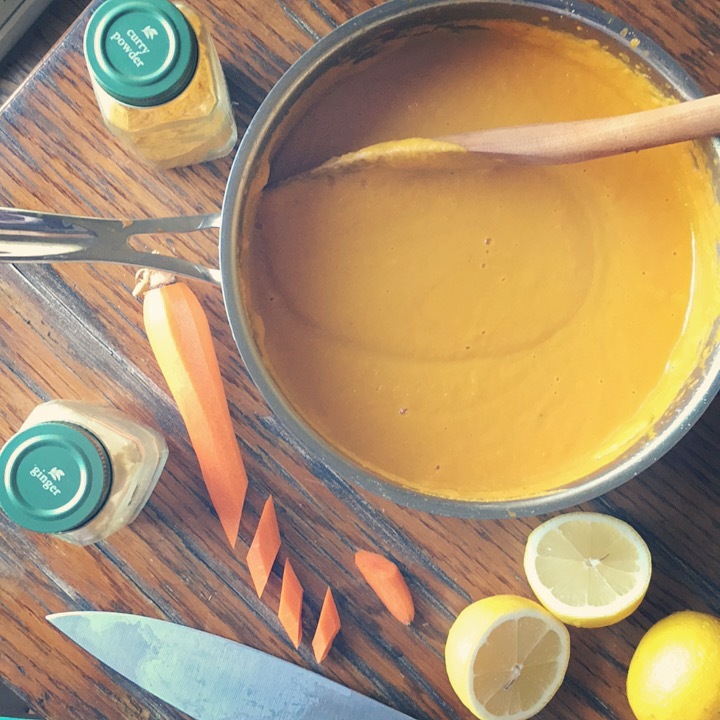 Working in small batches, pour the soup into a blender and puree until completely smooth or use an immersion blender until smooth. Add lemon juice. Add more salt to taste if necessary to bring out the carrot/ginger flavors.